A Major League Baseball stadium is so much more than a venue for America’s favorite pastime. It’s the setting in which history is made, underdogs win, epic comebacks happen, second chances are granted and dreams become reality. Loyal MLB fans will tell you, when they step foot into their beloved teams’ stadiums, it feels like home. They’ve come to be united by the promise that a win is within reach and anything is possible. And when you root for a team as beloved and powerful as the Texas Rangers—the 2011 American League West Champions—the management is certainly aware of what this team means to fans. That’s why they decided to upgrade The Ballpark at Arlington, Texas, with the best HD technology available on the market. As stadiums age and new technology becomes available, the facilities are upgrading to high-definition large-screen video because fans today expect it; they want to see all the stats and information at the ballpark as if they were watching the game on their HDTV at home. And they don’t want to miss any of the action when they’re walking along the concourse, ordering food and drinks at the concession stands or shopping in the team store. 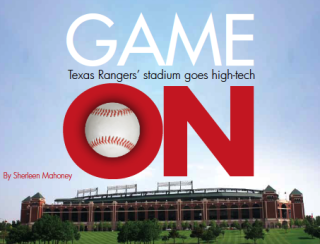 The Texas Rangers, led by Chuck Greenberg and Nolan Ryan, selected Daktronics, a world leader in providing scoreboards, LED video displays, message displays, digital billboards and sound systems for sports stadiums, to provide a high-definition upgrade for The Ballpark. The upgrade was completed in time for the April 1, 2011, Opening Day and incorporated large-screen LED displays, professional-grade LCD screens and a powerful control system to deliver high-definition digital content throughout the venue. The total cost was approximately $17 million. "The ballpark belongs to our fans," Greenberg said to mlb.com. "We wanted to make a wide spectrum of improvements that will touch every fan that comes to the ballpark, while keeping the aesthetics of the ballpark." Daktronics’ relationship with The Ballpark began prior to 1994, when the ballpark opened. They secured an order to supply incandescent scoreboards and displays. At the time, full-color LEDs were not commercially available for outdoor video screens. Daktronics has more than 40 years experience with outfitting stadiums, including Arizona Diamondback’s Chase Field, Kansas City Royal’s Kauffman Stadium and Pittsburgh Steelers’ Heinz Field. However, the company is still mindful to create a unique solution for each client. The process begins with understanding what the client is trying to achieve. “We work with facility managers, marketing, business development, operations staff and ownership to understand each group’s expectation and meet their needs,” Stevens said. The Rangers had an incredible season this year. The most exciting and memorable post-season game of the year was the ALCS Game 6 against the Detroit Tigers, where the Rangers scored nine runs in the bottom of the third inning. With their commanding lead of 15-5, they won a trip back to the World Series for the second consecutive year. During the World Series, for all the action and stats, fans turned to the Rangers’ new main video board behind right field. The 41x115-feet main display is six times bigger than the old video board, which measured 24x36 feet. The new display features the latest HD-15 technology with 840 lines of resolution in a super-wide aspect ratio. With the latest pixel design, pristine color clarity, blacker blacks and wide viewing angles, fans caught all the awe-inspiring moments as well as must-see instant replays that made this World Series one to remember. In addition, enhanced weather protection and other features improve reliability and operational efficiency. The super-wide aspect ratio allows for nearly unlimited possibilities in formatting content. It can display one giant live video screen or multiple zones to show lineups, line score, in-game stats, fantasy stats, promotions and whatever else the Rangers want to display. The same technology is used in the center-field auxiliary video board, a.k.a. the Coke board, to show additional video, stats and other information. Measuring 25 x29 feet, the display features HD-15 LED technology with 504 lines and 576 columns of resolution. It also can be integrated with other video displays in the stadium or show unique information. Located by left field, the full-color—4.4-trillion-color capability, to be exact—field-level out-of-town scoreboard has the ability to simultaneously present real-time out-of-town scores, information from other games in progress, video clips, head shots and animations. Three ribbon board displays circle the ballpark, measuring a total of 1,230 feet in length. Mounted on the lower-suite-level fascia, on the lower-home-run-porch fascia and below the Diamond Club, the ribbon boards display lineups, stats, pitch speeds, sponsor ads, home-run and towel-waving animations, graphics and video clips. When Texas Ranger Nelson Cruz in the ALCS Game 6 hit his sixth homerun of the series, setting the Major League record for home runs in a postseason series, the ribbons boards lit up his name, “Boom Stick” and the home run animation. And when the Rangers won the pennant, the ribbon boards displayed a fireworks animation while the players celebrated on the field and the fans went wild in the stands. Controlling all the content, including more than 800 Sony LCD monitors installed throughout the venue, is the Show Control System. Operators have complete flexibility in programming. They have the option to deliver the same content to all the screens simultaneously with the push of a button, divide the video boards into multiple zones and send different types of content to multiple channels on multiple displays—all thanks to IPTV technology. Even the concession menu boards are tied into the control system. Specific menu items can be promoted, items can be added or removed and prices can be changed in seconds. Content can be scheduled ahead of time on one display or on a group of displays and can even be streamed to digital billboards on the property or to remote locations around the city. And of course, content can be synced with mobile devices to interact with fans. Sports isn’t complete without sponsorships. To provide true sponsor exclusivity, content can be overridden on any or all LED or LCD displays in the ballpark to show a sponsor’s logo or advertisement, guaranteeing venue-wide exposure. The IPTV solution at the Rangers Ballpark was made possible in part through Enseo, a provider of digital media solutions for stadiums and arenas, digital signage and hospitality. Enseo’s HD3000 digital media player and Author application are integral to the technology upgrade at the ballpark. The HD3000 can receive content over a coax network. With the Author layout tool video, graphics and text can be combined on the screen to present a unified, branded message across the stadium, regardless of the channel watched. The Enseo solution overlays a visually appealing interface for fans onto live content. And since Enseo digital media players effectively work with existing coax infrastructure, this was done without the expense of re-cabling the ballpark. An added benefit of Enseo digital media players is that they provide a central point of TV control for all displays in the venue. “Taking advantage of IPTV technology gives customers the ability to drive high- definition content to screens throughout the facility with very low latency over a new or existing in-house data network,” Stevens said. Through their products and services, Daktronics delivers a “digital canvas,” which allows a facility to “paint and brand” their entire building in different ways for different events, different times during an event and different sponsors. The usual challenges exist with these large-scale, venue-wide super systems, such as removing existing displays, adding and modifying structure as necessary, scheduling installation around the facility’s calendar, managing subcontractors and getting all the displays communicating as part of a single network. But Daktronics excels at these projects and, with the help of a talented technical team, these aspects of installation are expertly handled. The relationship doesn’t end when the last screw is in place; Daktronics continues to support the system today. “In every way, shape and form, the visual images, the technology, the sound and our ability to present it in a cutting-edge way, thanks to a $4 million state-of-the- art control room, give us the ability to enhance the fan experience for every single fan, no matter where they’re sitting, standing or walking around the park,” Greenberg said on a press tour.